I have a good German Shepherd. His name is Tom. My Tom is very intelligent and very friendly. I brought Tom from my uncle's house. My uncle runs the German Shepherd puppy farms. One day I visited my uncles home. At that time Tom was a German Shepherd puppy.I really liked him at the first site so I wanted to take him to my home.Then I brought Tom from my uncles house. After I brought him to my house it was very difficult to care for him. When I went to school Tom looked me at me so sad. 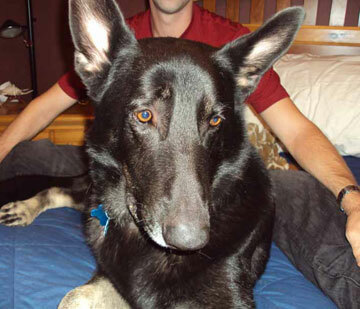 Then the German Shepherd, Tom, become friendly with all the family members. Also he started to play with us. He began to eat and drank well. So he grew well and become a good looking one. Then my father teach him to catch balls. Suddenly,he study how to catch balls. It is his daily game. He also give company to my father during the jogging. When father sits then he stands near to father and tell him to continue in his own way. Now the jogging becomes a habit to German Shepherd. Early morning he become ready for jogging. After jogging, he take the news paper from the gate. But he become violent when he see another dog in our yard. If he saw a stranger then, he began to bark loudly and give signal to us. We are very thankful to our German Shepherd Tom because he help my father to catch a thief from our yard. One day a thief entered into our yard in the night. Only my father was in the house. Then he began to bark loudly, and my father woke up and started to search. But he didn't see nothing. But Tom didn't stop his barking. He looks towards our kitchen side.Then father went there and catch the thief. So our German Shepherd, is a brave hero. I've owned a german shepherd and named him Tomy, previously peoples are very frequently open our copound wall gate and enter to main door, but now a days they are afried to enter in our street even. Tomy is such a aggressive to stranger he may kill then if we are not there. Awwww, what a sweet story! I'm so glad you shared your story. Sounds like Tom has found a home not only in your house, but your hearts as well!